A 4 hours tour that takes you around Phnom Bok Mountain pass by few small villages and pass by ride paddies with beautiful landscape,.. The final routes are decided only on the day directly with our tour leaders regarding your wishes to visit things, (Some tracks and paths can be flooded during the rainy season). We promise you unforgettable memories! A 4 hour tour that takes you around Phnom Boc Mountain and its beautiful temple on the top of the hill or that takes you to the floating villages when it’s possible. 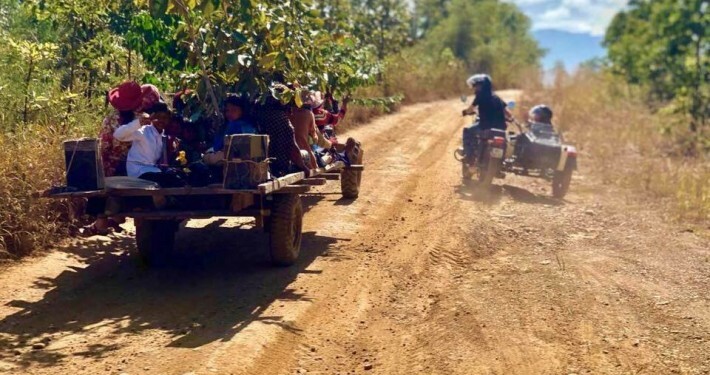 The final routes are decided only on the day directly with our tour leaders regarding your wishes to visit things, your aptitude to ride a Sidecar and of course the weather (Some tracks and paths can be flooded during the rainy season). Easy routes are chosen for beginners and a bit more challenging for experienced drivers. Upon receiving booking confirmation, we will send you the invoice. Then we require you to pay a full payment, in order to guarantee the booking. If you already in town and book us last minute you can pay direct to us before your tour start.